Central Texas cities are currently experiencing rapid development including commercial and residential properties. Development within New Braunfels has been primarily comprised of large, multi-phased residential subdivisions. With the influx of permits, KFA was contracted to assist the city in performing a detailed engineering review to ensure consistent designs throughout the city. KFA is providing general civil engineering consulting services, including development review assistance, reviewing permit submittals for compliance with city, state and federal codes, in addition to conformance with generally accepted engineering practices. KFA is focusing on reviewing the plans for general completeness as well as the drainage, water quality, and transportation design elements. In addition to permit reviews, KFA is assisting the city with streamlining their review process, developing permit applications, submittal templates, and review checklists as well as proposing revisions to codes and manuals. Services for the city is ongoing. 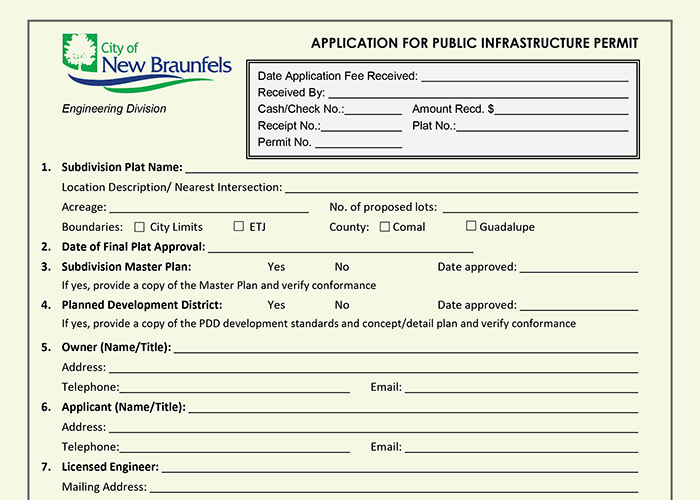 Development within New Braunfels has been primarily comprised of large multi-phase residential subdivisions. KFA is assisting the City with reviewing for compliance with city, state and federal codes, in addition to conformance with generally accepted engineering practices.